Dallying In The Dirt, Issue #065 --- Raleigh was great fun but now the garden calls. I went to Raleigh NC for 5 days and came back to 10 days of accumulated chores in the garden. How does that happen? It was very warm and humid in Raleigh which made garden touring a bit more interesting. Everybody seemed to quite interested in the shade gardens! I really enjoy these Garden Writer’s meetings. We see interesting gardens. We listen to a variety of speakers. We network and socialize with several hundred other garden writers. We do not have a holiday. Each day’s schedule started with breakfast at 6:45 am and usually ended after dinner about 9:00 pm. We all refer to it as a bit of a forced march but it is great fun and we can rest when we get home. Except for the accumulated gardening chores and the pages of writing to do. There were some very nice gardens that we toured but none that really jumped out as spectacular. I think I’m getting a bit jaded and hard to impress after years of touring gardens. The most interesting place was a commercial nursery, Plants Delight, that had an amazing array of plants available. They also had a very large display garden or small botanical garden that delighted me because almost every plant was labelled. Seeing something new and interesting and not being able to find out what it is can be very frustrating. 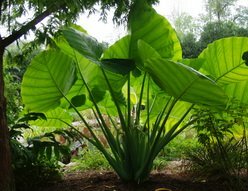 They were also breeders of a few types of plants including Colocasia (giant variety pictured,)and Alocasia that we often use as pond plants. Being in North Carolina, many of the plants that they were selling as landscape plants, I know as houseplants in my cold little corner of the world. 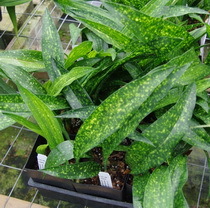 Aspidistra is a useful plant here because it will grow in quite low light. I was aware that there was both a plain and a variegated variety. This place had 20+ varieties of Aspidistra. (A. Seiun pictured.) Different sizes and different variegation patterns. Only the thought of packing them to fly and getting them legally across the border, not insurmountable problems, stopped me from buying a few of them. The September drought had finally ended when I returned to the garden and there was a wealth of produce waiting to be harvested and used. Despite my surplus, I stopped at the local farmer’s market and purchased a ½ bushel of sweet red Peppers. 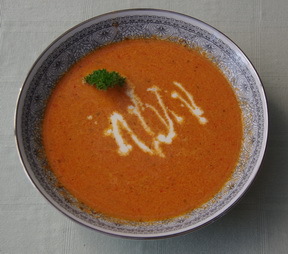 I simply cannot grow enough to make my large batch of Red Pepper Soup and it has become a family favourite. Before I can start on the garden’s fall clean up, I have to undertake a small but heavy chore which I judiciously left off the Assistant Gardener’s list while I was away. 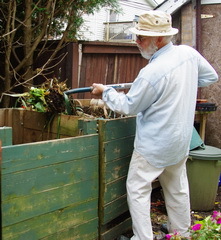 I need an empty compost bin. That means turning the contents of the filled bin over into the just emptied one. It really isn’t that big a job; it’s just one of those jobs that looms larger than life on the list. I continue to spray all of the part time houseplants every few days in a desperate attempt to bring as few as possible of the bugs and beasties into the house for the winter. I become a bit of a weather watcher at this time of year. Some, like the Cymbidium Orchids, like to have a few very cool nights to encourage the flower development. The Hibiscus, on the other hand, quickly becomes mush at the first hint of frost. The Christmas Cactus has already moved to its winter home where its short days / long nights , that initiate flowering, will not be interrupted by any indoor lights. Bulbs, Bulbs, Bulbs! The soil is starting to cool and it has received enough rain to make digging a bit easier. I will be starting to plant new bulbs in the next week or so. I have received a wonderful sample box of new varieties to try and am looking for the appropriate locations to plant them so that they will be readily observable next spring. We have well over a thousand bulbs already in the garden as they are a particular favourite of the Assistant Gardener. However many you have bought or planted, there are many more wonderful varieties that you really must give a home to. Spring flowering bulbs are one of the best bargains in the garden. A few dollars, a few minutes work in the fall and you get years of bright colour every spring. The front page of Gardening-enjoyed has a new look. Every week, if I can keep it up, there should be a new picture illustrating that weeks primary garden activity. You can just go there and see what I’m doing and maybe get a hint about what your own garden activities might include. This is followed by links to new and topical pages that you might find interesting now. My newsletter subscribers get to ask me questions. Just ‘reply’ to the email newsletter. It is always interesting to read the questions; mostly to see if I actually can answer them or if I have to wade into the textbooks to research the answers. If that happens then we all learn something. Soroosh Asks? We had very few sour cherry blossoms last spring which did not turn into fruits... then just a few weeks ago we sighted a couple of more blossoms. How confused is our tree? This was the second year since we had it planted. Why isn't it producing any fruits? I thought if we had another cherry tree, they would get pollinated. We have a sweet cherry that also did not produce any fruits. Ken Answers! You don’t indicate where you are gardening and there is a limit to where Cherry trees will grow and flower. If you get a late spring freeze that could kill many of the flower buds that had just started to open. The lack of fruit is a lack of pollination. Sour Cherries can be self pollinating but sweet cherries need at least two different trees to cross pollinate. Sweet and sour will not pollinate each other. I suspect that the late blooms are flower buds that developed this summer and the late warm weather in September has fooled them into thinking that it was spring. Barb Asks? Hi Ken, when is the best time to divide hardy mums and how should it be done? Ken Answers! Hardy mums are best divided as soon as you can see them emerging in the spring. Just dig up the whole clump and then chop it into pieces that are big enough to contain 2 or 3 healthy new shoots. These are quite tough plants and will respond and grow readily for you.